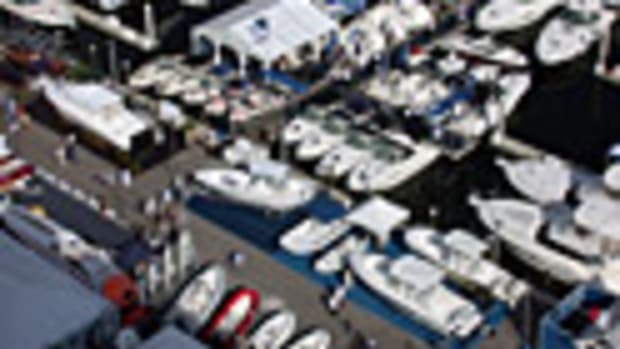 The recent Miami International Boat Show and the Yacht & Brokerage Show in Miami Beach saw sharp increases in the number of new boats on display. During the previous three years, some boatbuilders presented “new” models that were actually current hulls with deck, cabin or helm changes. That trend appears to be fading. This year, there was a deluge of truly fresh fiberglass at the two February shows. Soundings will include a roundup of new boats in the May issue — about 20 in all. The boats range from about 15 feet to 95 feet and include about a half-dozen center consoles, a handful of runabouts, a 40-foot express fishing boat, a 63-foot convertible, one dual console, two sport yachts and two motoryachts. Click here for a look at the new options displayed in Miami. The builders include Boston Whaler, Cabo, Chris-Craft, Contender, Four Winns, Grady-White, Hatteras, Mako, Pursuit, Sea Fox, Sea Ray and Tiara. We’ll also feature some smaller builders, such as Statement Marine and Ranger Tugs, and some European manufacturers, such as Cranchi. An array of engines and drives power these boats, from waterjets and pod drives to sterndrives and outboards. And as you’ll see, technology has reached the point at which just about any type of engine can be married to joystick steering. The new-boat prices range from about $12,000 to nearly $9 million.